We have had a few customers contact us, unsure on the finish of their router products and asking advise on how to acheive the best result or what products would be more suitable to their craft needs. 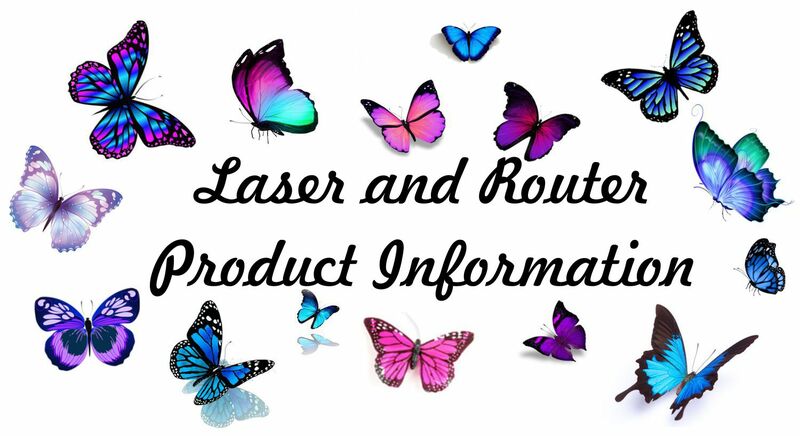 So we have decided to put together a small information page just to explain the difference between a laser cut product and a router cut product, for those who are unsure. We will also be adding tips & tricks for acheiving the best finish on router products. CNC Router which cuts 18mm, 12mm, 6mm mdf items. - Non burnt edges, as the machine cuts the items with a drill bit. This may sometimes leave a rough edge but smooth front and back. Laser machines which cut 6mm or 3mm mdf items. - Burnt edges due to the laser which burns rather than cuts the item. Gives a complete neat edge. Unfortunately router products are sometimes a little fluffy due to the fibres in the mdf, we do sand the items as well as round some items to finish them before selling. However they may still need preparation from the crafter. Not all router products need to be prepped by the crafter, if they are a straight forward cut then this leaves a good edge to work with, if the item is more detailed then this may leave a rough edge which will need work to get it to the finish you would like. If you do need to prep the items they may simply just need a light sand can sand brush off any sawdust before painting. In some cases you may need to do a little more prep, Sand first, brush away any dust, then use a base coat (Edges may need a few more coats as they are more porous than the front and back which are smooth), then let it dry and light sand again, brush away any dust before painting with your chosen colours. It is important to brush away any dust before painting as this can also affect the finished outcome of your product. We supply 18mm & 6mm router products. 18mm products are freestanding, can also be etched onto to add detail, it is used for large items such as; words, letters, shapes inside shapes, photo frames and more. 6mm is not freestanding but can be made to stand by adding a simple stand, it is not thick enough to be etched on so it is used for plain items such as; shapes, letters, signs on stands, 3D layered effect shapes and more. Laser cutting uses a high-powered beam to cut material based on computer-controlled parameters. As the laser guides its beam along the material, everything in its direct path is vaporized, burned or melted. One of the benefits of laser cutting technology is the cut product rarely needs any finishing work as this process ensures a high-quality surface finish. However, laser cut products do have burnt edges which may need a fe coats of paint to cover the burnt edges and acheive a quality finish. We recommend using a basecoat first and then your chosen colour. Medium Density Fibreboard (MDF) is a reconstituted wood panel product. It is a dry-processed fibreboard manufactured from wood fibres, MDF has an even density throughout and is smooth on both sides. MDF is primarily used for internal use applications, in part due to its poor moisture resistance. The edges of MDF boards absorb paint heavily. Make sure to seal these, especially if they have routed details. You can use an acrylic paint sealer or drywall sealer, or you can use glue or oil based primers which will help prevent the edges from swelling. Router products are great for a 'shabby chic' effect due to the texture of the wood but if your after a completely neat edge then laser cut products would be better for you as the burnt edges leave a smooth shape to work with. However Laser cut items may need a few more coats of paint to cover the burnt edges. We recommend using a base coat first and then your chosen colour.